Let's have a look at an example of how to define and verify the own betting strategy. We must find suitable played matches and set predictions for them. The betting strategy is defined by a group of conditions for both opponents. 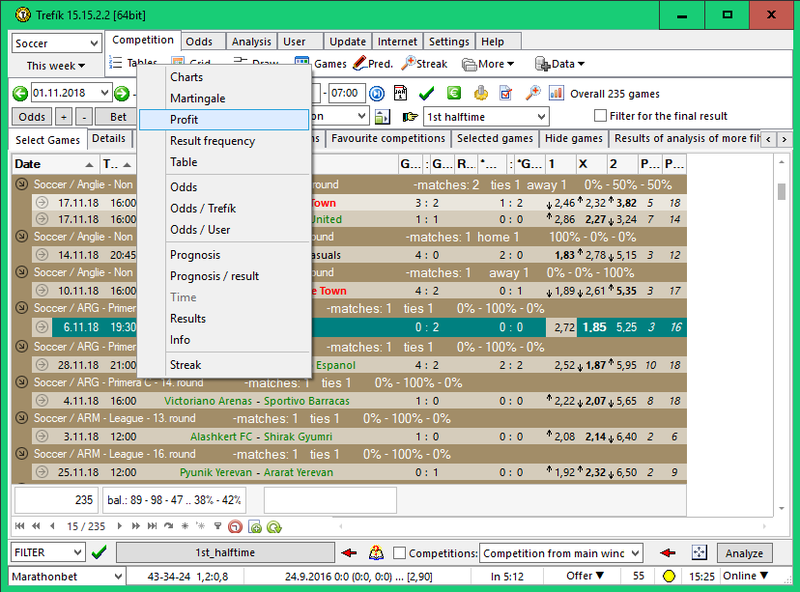 Trefik can find the list of matches which meet all the defined conditions according. 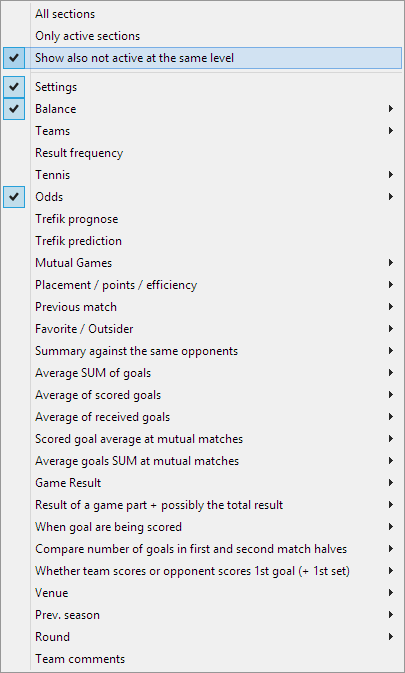 That is how Trefik can find the matches which fit your betting strategy. The window can be set so that there are shown only the active sections. Use the top left buttons and you can see all the available sections. "Analysis through competitions" - when active, the balance of teams are counted from all his matches (either league or cup matches) together. If this item is not active, the balance calculated for the team is from each competition separately. "How many days to analyze before selected period" - this value set the period used to calculation balance of teams. Beginning of the period is determined by the start date for the search matches and the value specified in this section of the window Filter. For example, if the specified value is 30, then balance of matches since 1st January will be computed when searching matches since 31st January. The picture shows that the balance for the teams will be counted from the time of 100 days before the beginning of the period from which we are looking for matches. Also, it is set that statistics from all of his matches in all competitions, where the team played will be counted for each team together. 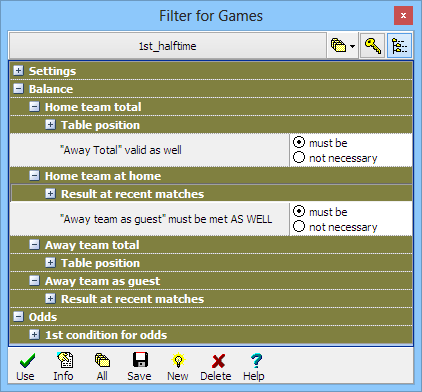 In the next section, "Home Team Total" filter can set the conditions for the overall balance of the home team, that means balance of his matches played either home or away. On the picture in this section the only condition is selected: The placement in the first half of the table. This means that we are looking for a match where the home team must be placed in the first half of the overall table of the competition before the match. 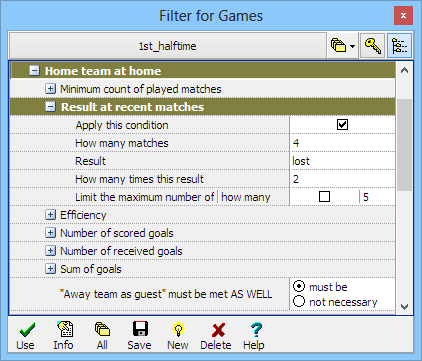 By the two terms in sections C and Away Home C is given that for each match found using this filter will be valid that before the match had to be the home team in the first half of the table, while visiting team in the second half of the table. 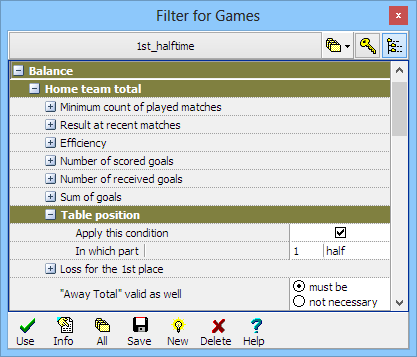 Since in this filter there is a condition counted from the table of competition then if we want to get filter results by the proposed strategy most appropriate for this filter we should not use it at the beginning of the leagues, where the table is not yet divided after playing only a small number of matches. The only selected condition determines that the home team lost in their last four home games twice (= the last 4 matches 2 lost). Team could also lose three or even all of the last four home games. If the item "max" on the right side is activated, then it would be possible to determine the highest number of matches that had the team lose in the last four games. In this section it is also set that the conditions in section Guests V must be met for the match, together with the terms of the section Domestic D. If this is not set, then all matches which met condition at least from one section either the Home D or Guests V would be found. Conditions for the balance of visiting team in its previous away games can be selected in the next section "Away team as guest". On the picture it is determined that the team in its last seven games away did not win at least four times. 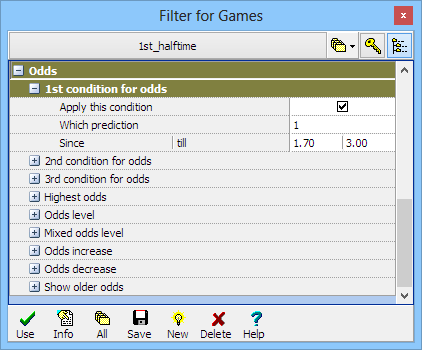 Conditions for the odds can be set in the last section of this filter. In the figure it is set that the odds for the tip 1, ie the home must be in the range of 1.70 to 3.00. So we want to find all matches where the home team is placed at the first half of the table against guests from the second half of the table. Home team is not playing well at their last home games because they lost two or more games from the last four matches. Guests, however, are away not so good, because they do not win at least four of the last seven matches. Using this strategy, we find matches to bet on home team, so the prediction 1, since we assume that the home team is the favorite team of the match (the position in the table) and also wants to improve after the last home failures. Restrictions of the odds value is made to be able to bet found matches at coupons separately. Odds lower than 1.70 in this case, means low profit. Odds higher than 3.00 on the contrary, are according to the bookmakers too much risky. If we want to get higher odds then we can use this filter for odds on the first half. This way also the balances (wins and losses in recent matches) will be computed from the results of the first halves in recent matches. Therefore the matches where the home team in their last four matches at home at least twice lost the first half, and vice versa where the guests away in the first half did not win at least four times in the last seven matches were be searched. Period to search for matches has been selected since the 1st November to 1st December. This fulfills our requirement that the table covered more rounds of the competition, which shows the strength of teams more than at the beginning of the season. The filter found a total of 235 matches (details are shown top right). 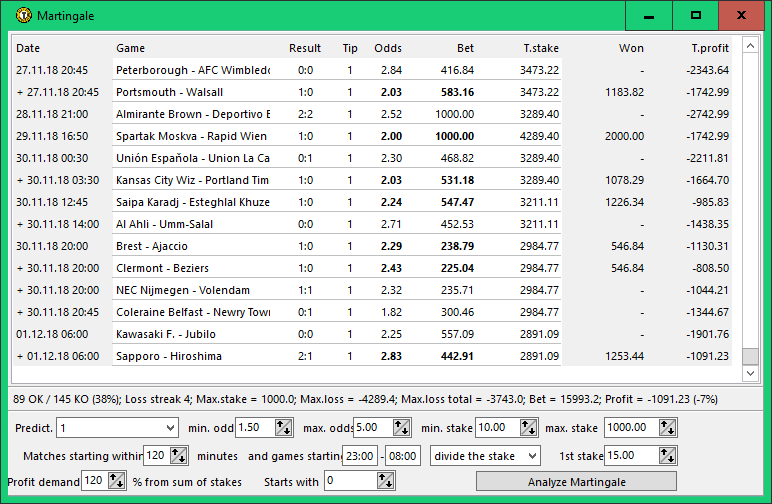 Note that as the type of bet is chosen 1st Half (above the matches list). 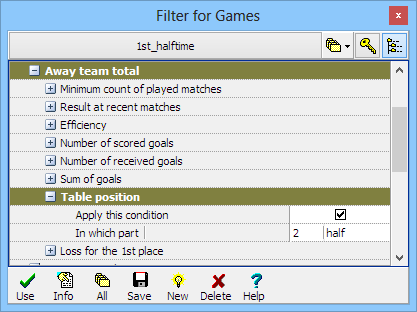 Besides the type of bets you set "filter on the end result" - if this item is active, then the conditions in the filter applied to the final results of the previous matches, not, as in our case, the results of the first halves. The filter thus found 235 matches. Of course we are interested, as we generally have succeed, if we were betting on matches for the specified filter. To do this, we can use the button Statistics and option PROFIT, as shown in the picture above. The situation where each bet would be bet independently on a single ticket, and when the stake of the bet is still the same, regardless of the odds value. The window is divided into rows according to the odds of the column tip and the tips that are available on the found matches. For the purpose of evaluating our filter, we will only deal with the tip column 1, ie home win. Balance of the bets on the tip of the same deposit is shown in each cell. Balance is expressed relative to the amount of the single bets on tiket. The cell contents are displayed in bold if the balance is profitable. The balance is always deducted by any handling fees paid for tickets (depending on the selected betting office). If the cell value is "0.22", then it means that we have earned 22% of our bet on single bet coupon. But we have to consider all bets at this cell. There are 16 bets (11 winning, 5 loosing). So the total stake is 16x of our equal stake. And the overal profit would be 22% of the overal stake. On the contrary, the value of "-1.00" means that none of the single bet coupons wins. So we would loose all the stake. 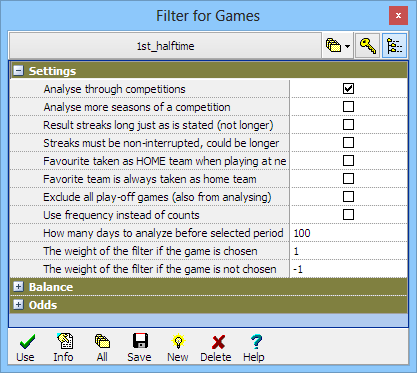 The overall balance of bets is listed for each tip on the bottom line. If you see a positive number there, then all bets on that tip matches found for will be overall profitable. 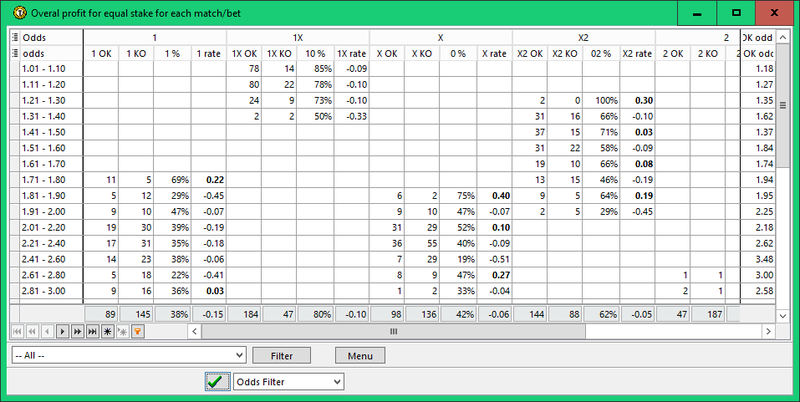 Matches found for this analysis are ordered by start time, as in the Martingale betting system we derive the deposit to the total current balance. To get deposit needed to the next bet, we have to know the outcome of previous bets. Trefik offers ways to deal with the situation when more games start at the same time, or when a match starts when the previous match is not finished, or even for more games starting over, but at night, when we can not submit tickets. In such situations, Trefík offers division of deposit to individual matches, or select just one bet according to the selected criteria. Anyway the most important is the choice of first bet and maximum bet amount (weakness of the Martingale system is simply too big stake at a time when several bets did not win and, therefore, the next bet we need get back not only all previous bets, but also a pre-determined profit). 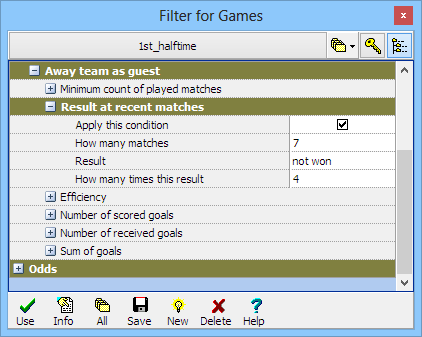 The figure shows result of analysis for tips 1 (home) with matching the matches found by our filter. It can be seen that with minimum bet 10 the total loss of the whole system is 1 091, ie the created filter is not suitable for the Martingale system. It is also calculated that the maximum total accumulated loss was 3 743. Maximum partial loss in a series of unsuccessful bet was 4 289 (but this was covered by earlier gains, so that the total loss in the system has never been higher than 3 743). The maximum stake per bet in the system was 1 000 (which was the value we set at the parameters at the bottom area). From this demonstration it should be clear how easy it is to verify the success of the filter with past known results and the success evaluated using analysis of particular bets.